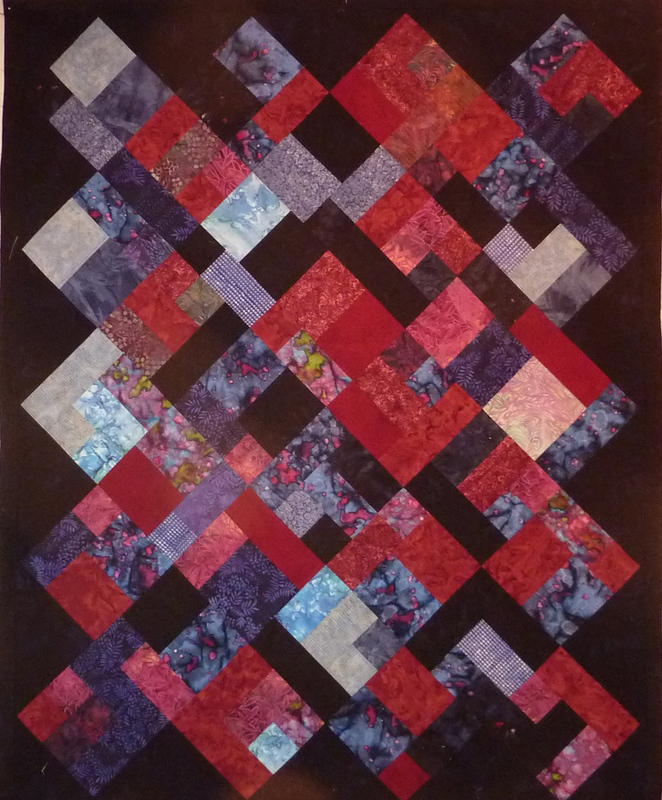 Awhile back when we were talking about design walls I had the pieces of this quilt up to demonstrate. Well it’s finally done – at least the quilt top is. 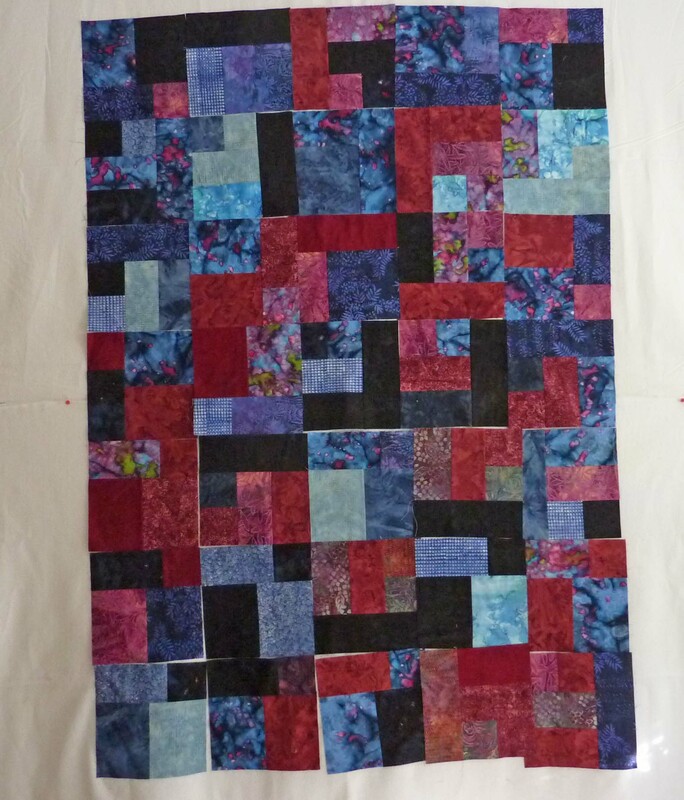 I still must lay it out, pin it, quilt it and bind it. Details, details. This was an experiment. I put these blocks on point just to see how it would work. I think I prefer the on point to the traditional setting; how ’bout you? I’ll put pictures of both settings up for you to see. First is the traditional set – unsewn on wall. 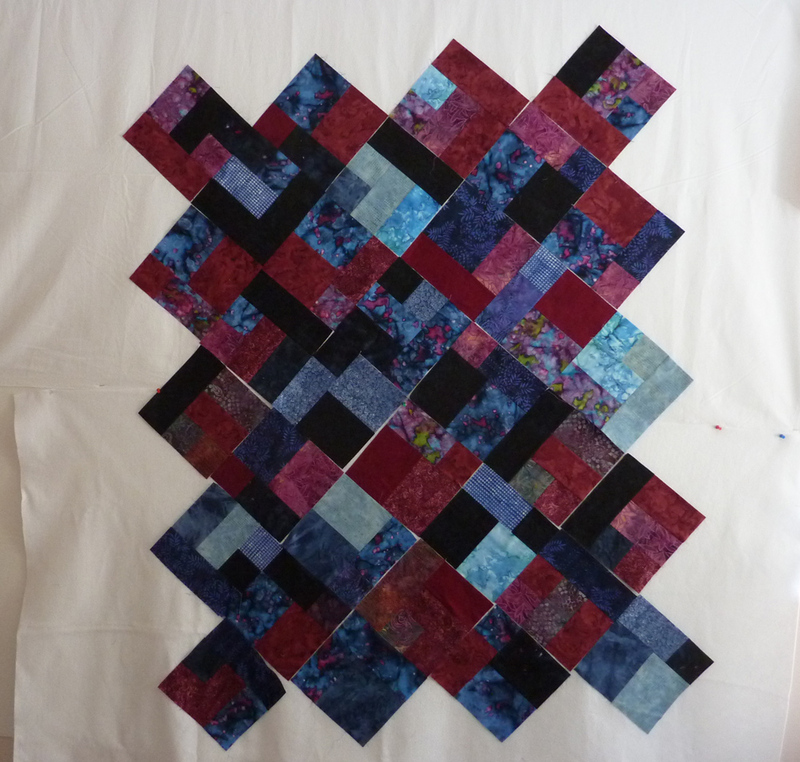 And I just added this photo of the diagonal set without the outer triangles and border – again unsewn. Interesting comments. I think that in order to do a real comparison, you need to place both layouts on the same background and photograph them in the same light. At first I was going to say that the burgundy pops in the “on point” version because it matches the background fabric. But then looking at both, the “on point” version is a much redder image. The blues are not very blue in that image, and I think it’s due to the photography, not the background fabric. So, I would be interested in seeing different photos before voting. :-). Debbie, I hadn’t noticed that before – but you’re so right – the colors do pop differently according to the setting. Thanks for commenting ! It’s interesting that you’re seeing “browns”. Maybe different monitors are displaying the colors differently. There is no brown fabric in the quilt. I can see however, how the deeper burgundy could read as brown. Guila, It is hard to believe it is the same squares, it looks so different. Although on point is very dramatic, I like the traditional because the blues and purples really accentuate the reds and browns. In the on point arrangement the reds and the browns over power the blues and purples.